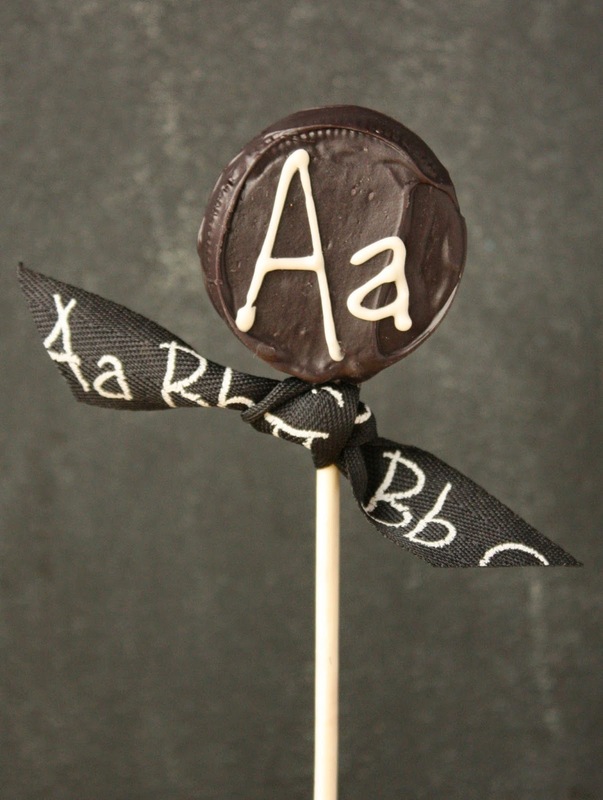 These Oreo blackboard cookie pops are so easy to make! They'd be a great treat to throw into a school lunch or serve as an after-school snack with a glass of cold milk. :) They's also be a fun treat for a class party. I'm sure any teacher would be happy to be gifted with these cookie pops too. 1. Melt black candy melts according to package directions and set aside (use dark chocolate if you can't find black). 2. Place cookies on wax paper. 3. Gently remove top chocolate cookie and set aside. 4. Gently press a lollipop stick onto the exposed white cookie creme, about halfway up. 5. Put a dab of melted candy to cover the top of the stick and gently press the removed chocolate cookie back on top. 6. When the candy melt has dried and the stick is firmly adhered, dip (re-melt if you need to) the cookie into the black candy melt until it is completely covered. 7. Let the excess drip off, and if you need to, use a small offset spatula (or knife) to smooth the candy over the cookie and make sure it is completely covered. 8. Place the sticks in the styrofoam block and let cookies dry completely. 9. Use white royal icing (or white candy melt) and a #1 or #2 tip to add the letters. I put alternate letters on both sides of the cookie. They are so cute Sue! I love them with the blackboard background. It is so "Back to School!" LOVE! What a creative idea! I would have loved to receive a set of these when I was teaching. I might have to try them with the kids to give their teachers on the first day. Thanks for sharing! You are a life artist, Sue. These look so gorgeous. Thanks for your sweet comment, Angie. So adorable! A perfect back-to-school treat. So clever! I love these! I think. Wish I'd seen your post before my li'l one started school. Oh so cute, I would love to do homework with an edible chalk board! Thanks for sharing your idea, you made oreo blackboard cookie pops with using black candy melts, Lollipop sticks and polystyrene block, I love it so I decided to make this for me one time when I will free from my schedule.